Beech trees (Fagus spp.) are a small group of long-lived hardwoods found in the temperate forests of the world. They are large, stately trees that give a noble quality to the landscape. Beeches have an upright growth habit with an open pyramidal form when young that develops into a rounded canopy with age. They can eventually grow to 100 feet or more, though they are slow-growing and will take many, many decades to reach that height. Beeches have tiny, nondescript flowers in spring which give way to small nuts by fall. The foliage is serrated and elliptical, 3 to 4 inches in length and turns golden yellow in fall. The smooth grey bark is perhaps the showiest single part of the tree. Beeches are adapted to a wide variety of soils as long as they are well-drained. However, as forest trees, they prefer a soil that is fairly rich in organic matter, so it's worthwhile to mix a copious quantity of compost into the soil at planting time. They prefer humid climates with summer rainfall and are a poor choice for arid areas. The best time to plant a beech tree is in fall though any time of year that when ground is not frozen and the weather is not extremely hot is fine. 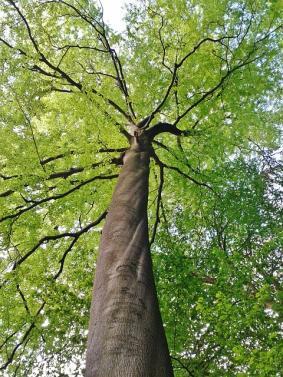 Beech trees will eventually outgrow most other trees around them and reach into the sun, but they are more than happy to spend their early years in either sun or part shade. One of the most important considerations with beeches is to plant them well away from any paved surface. They have very shallow, powerful roots that can destroy sidewalks, patios and driveways. Because of their size, they are used primarily as a shade tree, where they make an impressive focal point in the landscape. Beeches require virtually no care once established. For the first few years after planting give them a deep soaking every few weeks to encourage the roots to grow down to where they can access groundwater and provide good anchorage for the tree as it grows tall. The wood is extremely hard so they rarely lose braches in storms, but if a branch breaks, make a clean cut rather than leaving the wood jagged. Prune off any 'suckers' that grow from the base and remove the lower limbs to expose the attractive bark if desired. No other pruning is required. In a suitable climate, beeches are generally very healthy trees. There are a number of pests and disease that may show up, however, including, aphids, powdery mildew, beech bark disease and beech scale. The last two are the most problematic and often go hand in hand. If you see waxy light-colored spots on the leaves, beech scale is the likely culprit and beech bark disease may soon follow which is a serious disease that can threaten the life of the tree. It is impractical for homeowners to treat these types of pests and disease on large trees, so call a certified arborist if you are concerned. 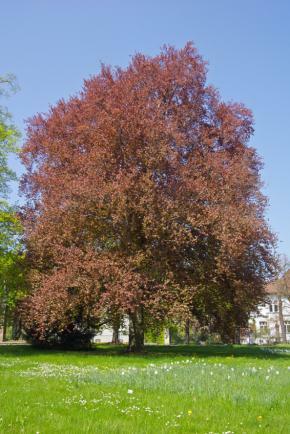 There are many ornamental varieties of the European beech (Fagus sylvatica), which is the species mosts commonly used in landscaping, though the American beech (Fagus grandifolia) is sometimes planted as well. The former is widely available in nursery, while the latter is more likely found at a mail order nursery. 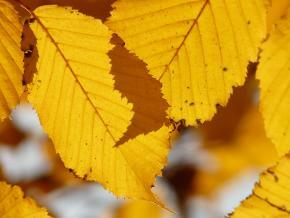 American beeches are hardy on USDA zones 4 to 9; European beeches are hardy in USDA zone 4 to 7. Tricolor' has variegated green, pink and white leaves and grows to only 40 feet tall. 'Purpurea' has deep purple-burgundy leaves and grow to about 50 feet tall. 'Aurea Pendula' is a very narrow upright variety growing just 20 feet tall with chartreuse leaves and weeping branches. Beeches are majestic forest trees with much value as landscape specimens. In addition to their beauty, beech nuts are a significant food source for many animals, making it a good choice for improving wildlife habitat in urban areas.